Home › Kram's Korner - From the Club Level › Losing: It’s Not OK. The losing continues for the IronPigs. It looks like the SteelHawks will miss out on a home playoff date because they lost yesterday as well. The Phantoms are busy hiring a “professional” fan and auctioning jerseys for profit instead of charity. Does anyone care about winning games anymore? I believe it was in Friday’s game. The best hitter on the team, OF Brian Bogusevic, smashed his bat–among other things–in the tunnel following a bad at-bat. Actually, I don’t remember that he really had any “bad” at-bats, per se, but the frustration was boiling over for him, to the point that he pulled a “Gillies.” It’s not clear if his absence from the lineup Saturday and Sunday was in any way associated. Yesterday, during an 8th-inning rally with the first-place Indianapolis Indians, Tyler Henson was called out looking on a 3-2 pitch which was clearly low. He immediately lost his cool–and got tossed for his trouble. 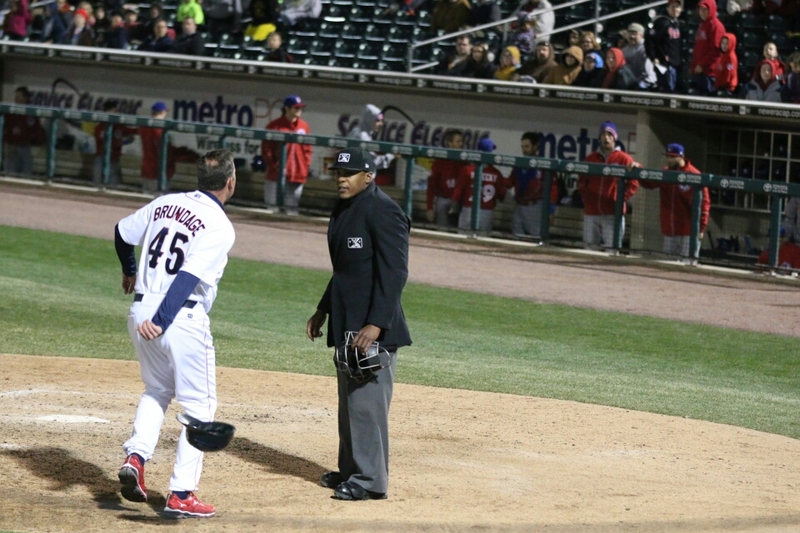 Manager Dave Brundage, defending his player, and also got tossed from the game. The SteelHawks reportedly played very poorly Saturday night. They had a lot on the line, and were up against a team they had beaten on the road. It was their rival, Trenton, but a win would have locked up a playoff birth and also made a home playoff game very likely. A home playoff game means a lot less travel time, the home field advantage for reaching the championship game, in addition to the additional “opening” for the team which would produce revenue in the form of ticket sales, concessions and sponsorship. Finally, a “playoff game” would be something to promote–something to get fans and the public excited about in the first year of professional indoor football at the PPL Center arena. The Phantoms were sloppy, but competitive early on in the 2014-2015 season. But ultimately, they couldn’t play with enough discipline or skill to win the games necessary to make the Calder Cup tournament. Indeed, that would have meant extra “openings” and revenue as well, and hockey playoffs are probably easier to sell than baseball or indoor football. Still, we were able to get a “professional” fan to take off T-Shirt after T-Shirt to keep the fans entertained. Sources tell me he made thousands of dollars for his appearances, but I don’t think he helped the team very much. We don’t really know, of course. It could be that Brian’s frustration the other day had to do with the fact that his July 1 “opt-out” had been made public, and he’s feeling the pressure to produce. It could be that Tyler was frustrated with earlier missed calls by a home-plate ump who was inconsistent all afternoon–or maybe he was stressed by the upcoming road trip and having to be away from his family. I have no idea. But the two old dudes in the stands were happy to see some emotion. We were happy to see Jordan Danks lay out for a ball in Center Field rather than ole’ it like a bullfighter. Glad to see some emotion on the field at a time when the game was in the balance–runners on base, no outs, down by 2 runs…. The losing is no fun for the old dudes in the stands. I’m sure it’s no fun for the players as well. 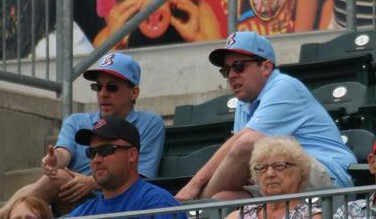 Here’s hoping things turn around for the IronPigs as the summer rolls on and the roster changes continue. 21-37, 11.5 games back, and 3-7 Last 10 is no way to go through a season. Promotions are coming. Let’s hope we can win some games. One roster note: RHP Severino Gonzalez was optioned back to the IronPigs Saturday night. Some kind of corresponding move will certainly be made, but a fifth starter won’t be needed until Tuesday 6/16 by my calculations, and the IronPigs have roster space aplenty. Since that’s 10 days from the time of option, Severino could certainly return to make that start. In the mean time, perhaps a reliever will go up to fill in–unless they want an extra bat. They have the 40-man room if they want Bogey or a non-roster pitcher. Lots of flexibility–if nothing else. A roster post will be available when the moves have been completed.